On Thursday the 16th November we toasted the arrival of Jenny Packham to our collection of bridal designers. Back in April on a crisp spring day, we started our whirlwind journey to boho bridal gorgeousness with Miss Rachel Webster. We were set with the brief that she was on a wedding planning mission and that the big day was the 2nd July... This year! 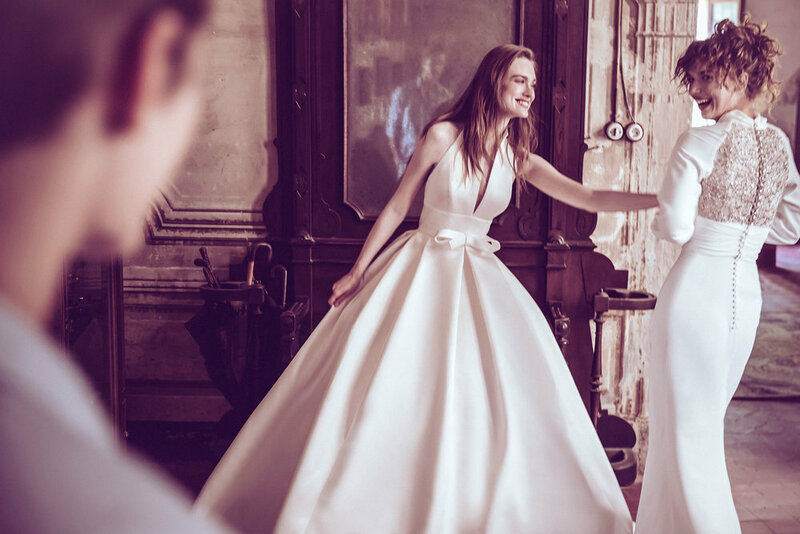 Safe in the knowledge that we work with the most flexible and supportive bridal brands we accepted this challenge. Every time Rachel stepped foot into the Frances Day boutique, she had this unknown power to put a smile on everyone's faces with her 'no nonsense' yet girly personality. 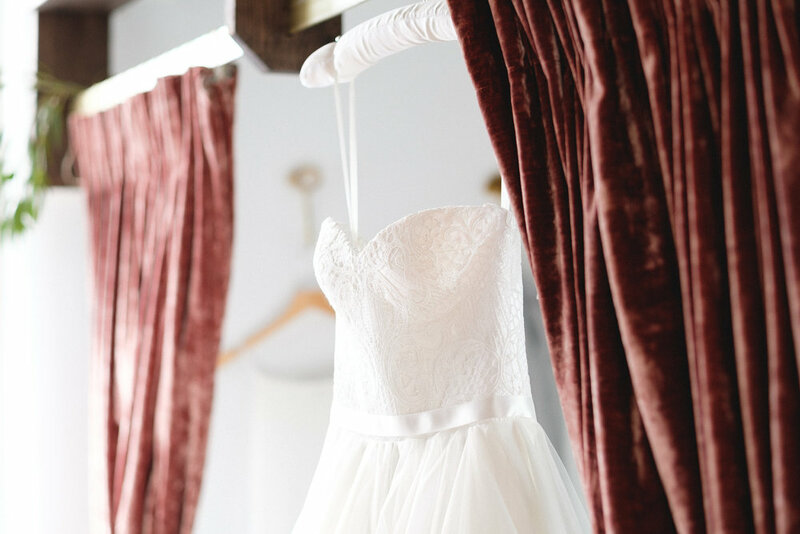 Rachel - if you are reading this I hope you are not too horrified that I have used the word 'girly' to describe you - but you did have probably the most admiration for every bridal gown in the shop that I have ever seen! Girly in the non traditional sense. Rachel finally set her heart on the epically beautiful bohemian 'Elise' by Augusta Jones. And to give her bridal look the rock chic edge she chose 'Sarah' by I Am Florence as her bridal shoe. 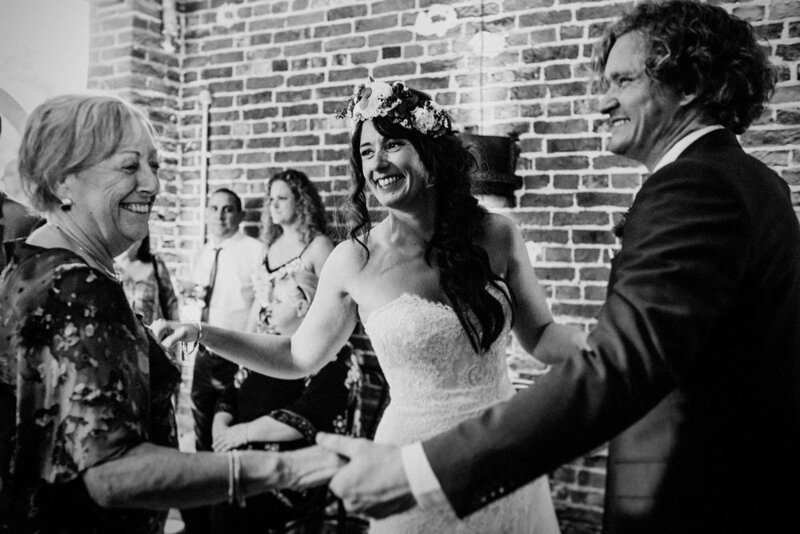 Now pop the kettle on, put your feet up and have a read of how Rachel did things her way on the day she married Sam at Hazel Gap Barn. This is a very special one folks - Enjoy! Venue: Tell us a little about your venue and why you chose it? 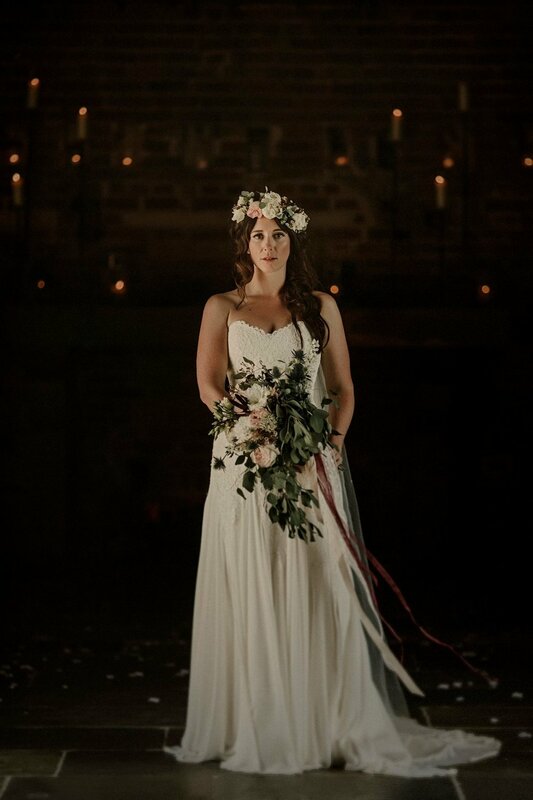 We wanted a magical woodland theme wedding but the UK doesn’t have many of those venues to offer. Hazel Gap was brand new, hadn’t been finished and we were looking for something available within 3 months of starting our search as it was a short engagement. It wasn’t finished but it was rustic and old and had real natural charm (and lots of fairy lights) so we took a small chance. The reviews for all their other venues were amazing and we liked that everything was under one roof so we could have ceremony, drinks and reception without any fuss. It also backs onto woodland so it was as close as possible to what we wanted and close to my family in the area. Special details and memories from your wedding day? Any surprises? I couldn’t believe how excited yet calm I was when it came to the ceremony and the aisle! I had been worrying for weeks about it but on the day I couldn’t wait to get down it and see the room and the people and my man! I am probably a rare breed of bride that said hi to people on my walk down… it really was the happiest day of my life so far. The ceremony room looked amazing thanks to my florist and it was more magical than we had even imagined! Your shopping experience – did you go for a dress style that you had always lusted over or was your choice a complete surprise even to yourself? I was quite open-minded about the dress, I love clothes, always struggle to make decisions and just wanted something that suited the woodland theme and suited me. 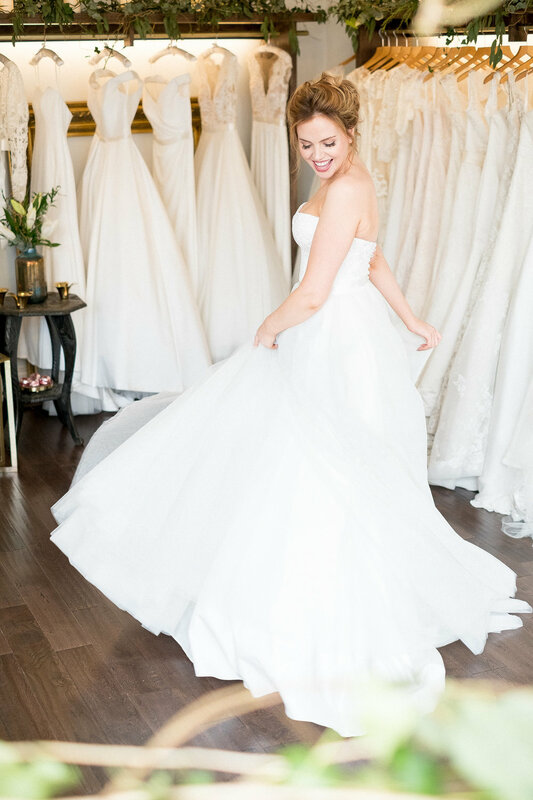 Julia was amazing and I tried on quite a few that were lovely but it was the gorgeous, layered, silk chiffon skirt of my Augusta Jones Elise that sealed the deal. I could wear that skirt every day and feel pretty! As it was a Summer wedding I wanted my girls in something light and pretty and a little woodlandy if possible however wanted them to be able to maybe wear again. I went for Coast dresses in pale pink with lace applique top, chiffon skirt and hidden , comfy waist. The men were all squeezed into 3 piece Navy suits. 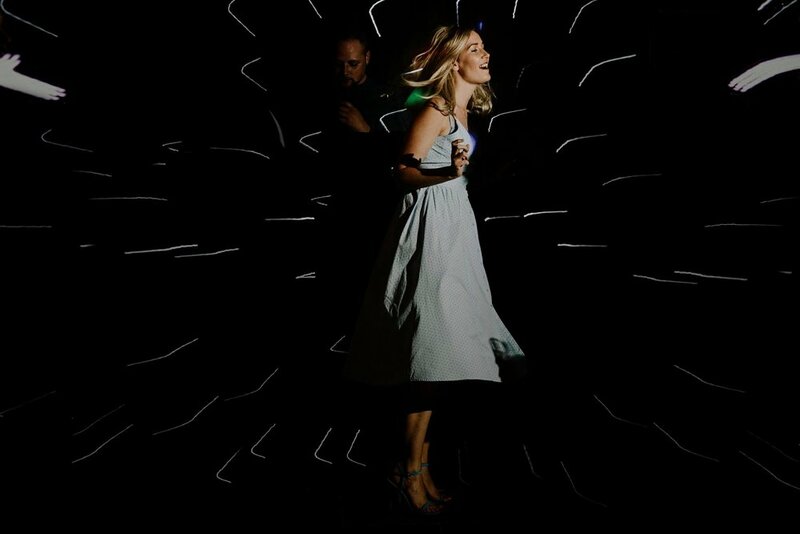 Wedding Party Vibe: What inspired your wedding celebration? Did you have a common theme running throughout the day? Relaxed and woodland. Sam (hubby) always calls me his pixie princess (haha) and we both love the outdoors and anything made from natural materials, especially wood. We wanted an informal, chilled and welcoming vibe for the day and this was what we focused on when we tried to keep things simple. All our decorations were ivy, eucalyptus, roses, wood and candles. Food at Hazel Gap is BBQ style meat (we had Sirloins that you carve at the table) so it means guests interact and get involved and if you like it enough there is more than enough for a second helping. Any special suppliers that you used who stood out for you? ie. Photographer / caterer / florist? All of our suppliers were absolutely incredible!! We planned our wedding in less than 3 months and we were so lucky the people we wanted were available to do this and were so flexible in order to create what we wanted on the day and on the run up as well. I will list all of them as it was their flexibility and passion that made everything come together so perfectly in the end. However - Debbie Yates – Flower Consultant – Debbie went above and beyond and created the most magical, beautiful environment for us. Her vision and creativity took our breath away on the day and we cannot thank you enough as we didn’t have a huge flower budget but we couldn’t have asked for more! Thank you. Photography - Samantha Hook – did a post-wedding shoot in the woods and really listened to create the photos we wanted. Cake - The Sweet Stuff - Natasha was so excited for us, the cake still tastes amazing! Am I allowed to mention Julia at Frances Day for probably being more excited than me about my wedding and my dress? You were fab, thank you! !